“In those rugged and ragged canvases lay in germ pretty nearly all the experimentations and aberrations that were to mark the next quarter century. . . . In this series, Young Artists Exhibitions Program Coordinator Emily Bray profiles participants in the 2013 James McLaughlin Memorial Staff Show. Join us tonight for a reception, 5 to 8 pm! Lydia O’Connor holds a Master of Philosophy in Film Theory from Trinity College Dublin. While she considers herself a great appreciator of art and the artistic process, this is her first foray into the creative side of the art world. Finance Assistant. I get to enjoy a birds-eye view of the entire museum’s operations from conservation to curatorial to education to facilities and maintenance through the daily financial aspects that cross my desk. The Phillips Collection enjoys a star-studded list of artists including Van Gogh, Degas, Renoir, Picasso, Cezanne, Klee, Rothko and so many more… . It’s quite difficult to choose a favorite when you’re in the presence of such awe-inspiring masterworks. I absolutely adore Wassily Kandinsky. The Phillips Collection has several Kandinsky paintings and I am always excited when these are on display. The Music Room for me is a very special place. While much of our gallery space is typical white walls, the original home carries a spirit I think is thrilling to the museum experience. The Music Room has a drama and a life that’s unique. I really feel like I am in the home of Duncan and Marjorie Phillips and the many beautiful concerts and events we hold here at the Phillips seem to reverberate from floor to ceiling. I took this photo one morning in early April. 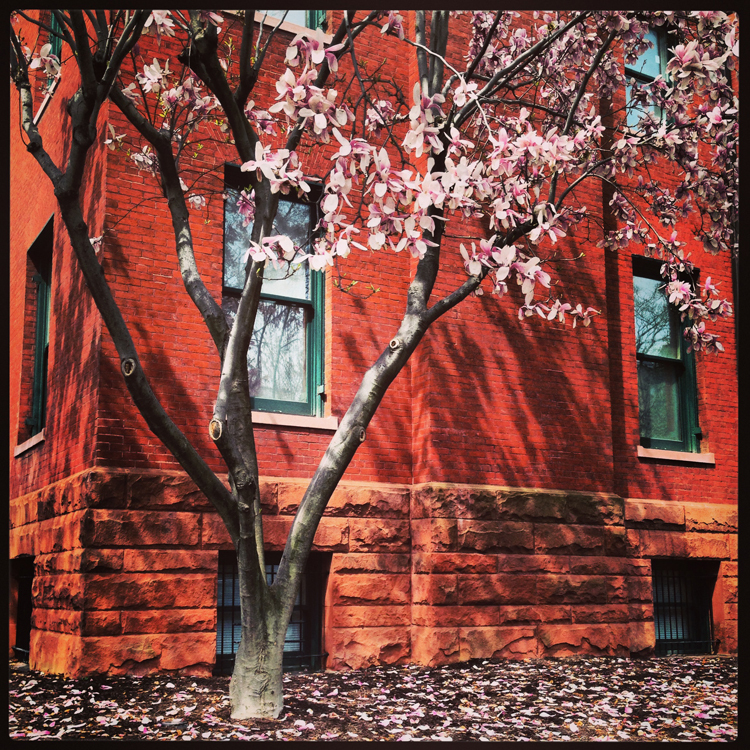 I noticed as I walked up Q street from the Dupont Circle metro that the wonderful lavender petals from our tulip magnolia tree were shedding creating a blanket of color beneath the red brick of the original house; the play of the light sprinkling shadows across the building in the morning sunshine. It was a moment of Phillips magic. A few hours later when I left the office for lunch, the tree was bare and many of the petals that had carpeted the ground had blown away. I knew then I had been witness to a special and fleeting moment in the life of this tree. 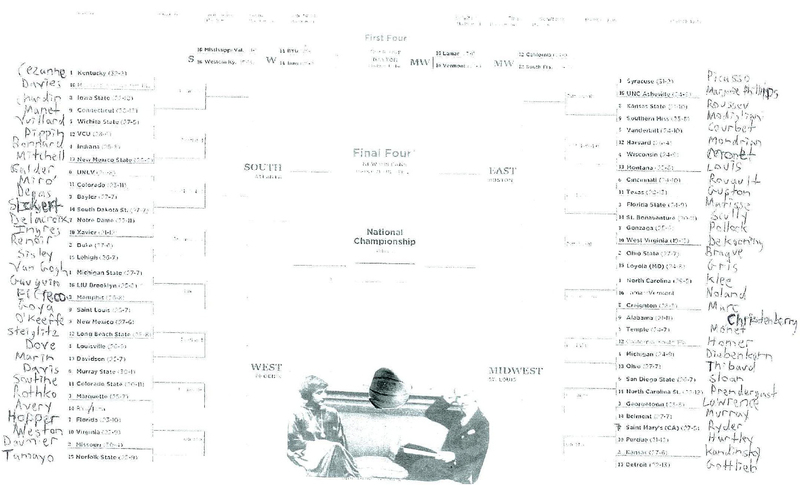 Every year around this time March Madness, the annual college basketball tournament involving 68 teams, sweeps the nation. In workplaces all over America, the office betting pool is organized and people gather around the actual or virtual water coolers and compare how they did in their brackets. I’ve noticed an unsurprising lack of interest in this over-commercialized, hyperbolic expression of American sports here at the Phillips, bastion of high culture that we are. But despite my nerdy love of art history and long time as a museum professional, I am still a huge college basketball fan. In fact my first year on the job here, I won the great respect of our former director, deputy director, and CFO (all men) by winning the college basketball pool organized by the CFO. After the CFO left the museum, it fell to me to organize the college basketball betting pool. A few years ago, I thought of a way to make the event slightly more interesting to those who had little or no interest in March Madness. What if I associated each team participating in the tournament with artists prominent in the museum’s collection? It could be ART MADNESS. 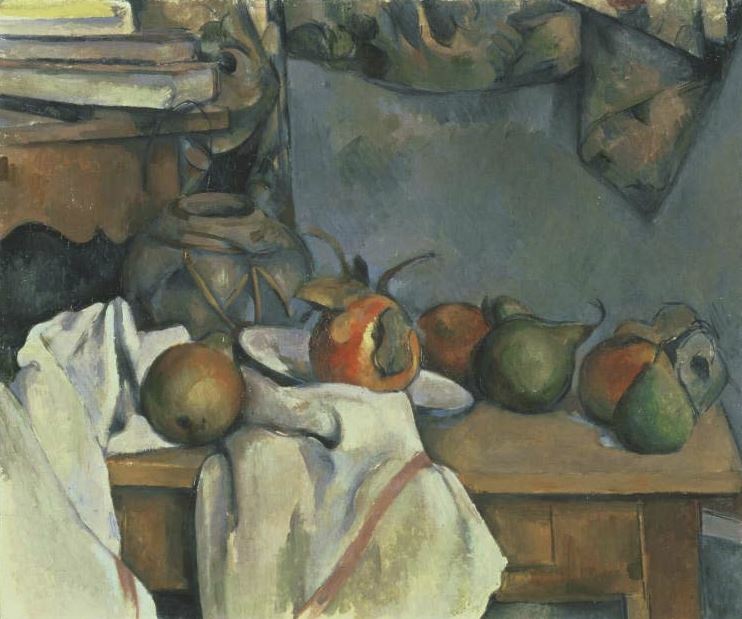 Those who did not know a Duke Blue Devil from a North Carolina Tar Heel might be able to see that if this year’s #1 seed Kentucky was associated with Cézanne, they could defeat a #16 team paired with Arthur B. Davies. The higher seeds would be paired with the most prominent artists, for example van Gogh, Klee, and Picasso are #1 seeds. There were other fun possibilities. I could pair Georgia O’Keeffe with New Mexico and William Christenberry with Alabama. Some teams were paired with artists with whom I could not imagine the relationship–what does Notre Dame have to do with Delacroix or Xavier with Ingres (aside from Catholicism)? The teams play one another in the first round, and the two artists were long time rivals. And of course, Alfred Stieglitz was paired with a team slated to take on Georgia O’Keeffe/New Mexico. Naturally, I made mistakes. I left Edward Hopper out of the first version of ART MADNESS and did not make a place for Thomas Eakins in the final version. One participant noted that it seems unfair to give Marjorie Phillips (our founder’s wife and an accomplished painter) only a 16th seed. 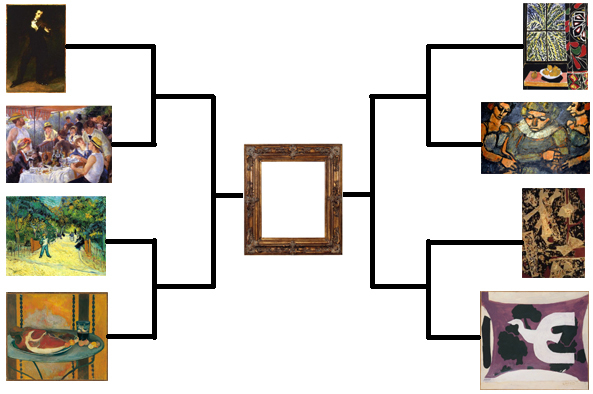 Not to mention that I made Renoir a #2 seed because his style of painting seems to me a perfect match for Duke. As arguable as they may be, all of my choices are based on some criteria. Did ART MADNESS increase participation by Phillips staff, you ask? Well this year’s pool has 22 participants. Not much maybe, but that’s the largest number in my eight years at the museum. Although as the person who keeps track of the brackets, I must admit that everyone who participated picked teams not artists, and all the selections are plausible. No one seems to have made any arbitrary or artist-based selections. Hmm . . . maybe people at the museum are more interested in college basketball than I thought? 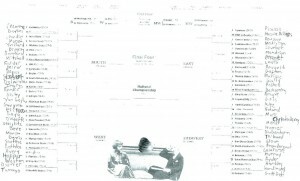 Click the image to enlarge and discover Paul’s artist/team pairings for Art Madness 2012.